If you haven't heard, the former chairman of Nissan was arrested for financial misdoings. The repercussions are being felt throughout the auto industry but most directly and immediately with the Nissan brand itself, of course. For example, Nissan was supposed to unveil an upgraded LEAF EV to the publich in L.A. last week at the annual auto show, but it had to pull back. It comes at a particularly bad time when EVs are bumping up range across virtually all brands and introducing new EV models. In 2017, we reported that the LEAF would eventually bump up its range in a higher trim "E-Plus" model (from 150 to 225 on a single charge. But instead of doing that at the L.A. Auto Show, Nissan instead brought two slightly refreshed models, the Maxima sedan and the Murano crossover. The extended range LEAF release had even been planned to the point where the brand was going to use actress and brand ambassador Margot Robbie to talk about the new car at the Japanese American National Museum in L.A.
That number on the left-hand side was going to read 225, but that is not to be (at least for now). The details surrounding Ghosn's arrest are pretty dramatic. He is accused of vastly underreporting his income by a whopping $44 million and using company money for personal reasons. He could face up to 10 years in prison and face fines. Bloomberg reported that in the wake of his arrest, shares of Nissan Motor Co. dropped most in two years (5.5 percent). The fallout is pretty big since it looks like Nissan might no longer operate independently as an automaker because French automaker Renault may try to get a controlling stake. In the current state of limbo, new products like the extended range LEAF are being shelved at least until the dust settles. Both Nissan and alliance partner Mitsubishi quickly removed Ghosn as chairman, but he remains CEO at Renault, the third member of the automotive partnership. 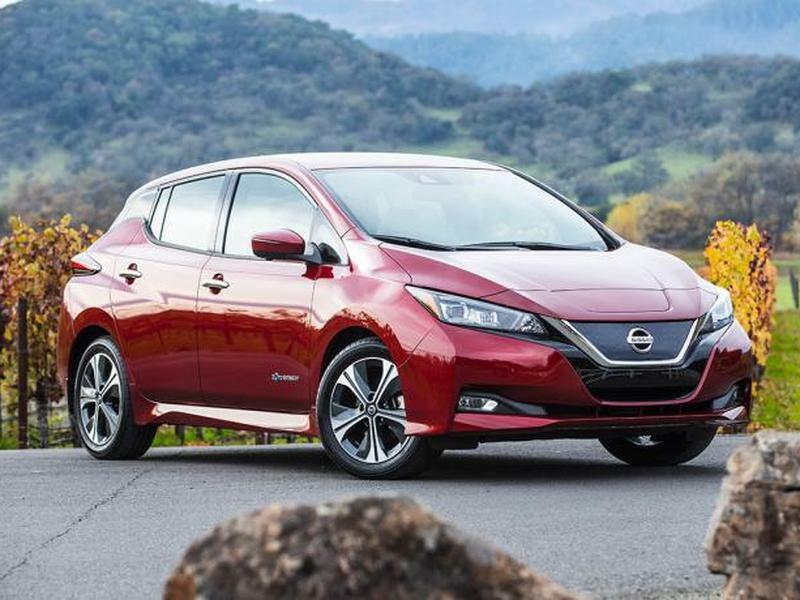 "The official announcement regarding details of the 2019 Nissan Leaf with additional performance capabilities is postponed to a later date," Nissan communicated in a statement. A Nissan spokesman informed the Wall Street Journal that the delay in revealing the new LEAF was "to ensure that this important product unveiling could receive the coverage it merits." That's clearly reactionary and spun in the wake of the Ghosn debacle. The details on the unreleased LEAF are important given the rise of EVs lately. NIssan stated that the actual sale date hasn't changed, but the unveiling date has been delayed. There are no details on this beyond what's been already shared by Nissan. This is a significant increase from the 40-kWh battery the and 150-mile range of the current model. The E-Plus LEAF would've been priced at $36,385, about $5K more than the base LEAF. You know we definitely won't get this bad boy. The LEAF RC Nismo is an EV monster. In other LEAF news, there's another version we know we'll pretty much never get, much less even see in the flesh, and it's called the LEAF RC Nismo. It's a race car that's only in Japan for racing purposes. It has dual electric motors and an insane 478 lb-ft of torque for a 0-62 mph time of 3.4 seconds. The two 120-kW electric motors "more than double the maximum power," but no actual horsepower numbers were revealed. Chalk up another LEAF that's out of our grasp. We'll keep you posted on the news about the extended range LEAF when that information comes to us. In the meantime, you'll have to settle for the base 150-mile range LEAF or go to other models like the Kia Soul EV, Volkswagen e-Golf, Hyundai Ioniq EV, or the Kia Niro EV., all great and affordable choices when it comes to electric cars.